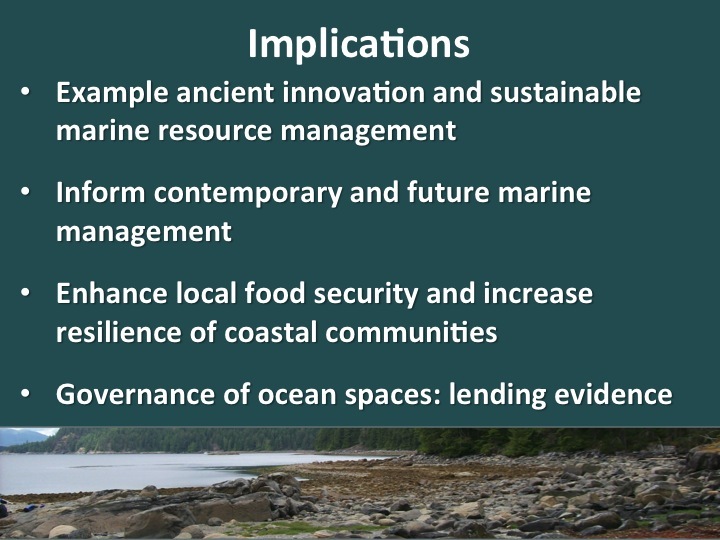 Northwest Coast First Peoples made clam garden terraces to expand ideal clam habitat at tidal heights that provided optimal conditions for clam growth and survival, therefore enhancing food production and increasing food security. Clam gardens, while all being characterized by a level terrace behind a rock wall in the lower intertidal, are diverse in their shapes and sizes. Photo: Amy S. Groesbeck. 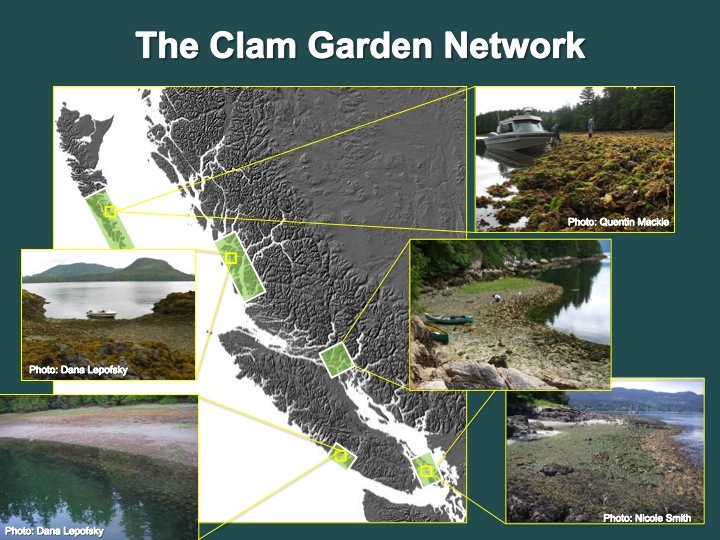 Clam gardens are part of a suite of marine and terrestrial resource management practices employed by Northwest Coast First Peoples to enhance food production and increase food security. 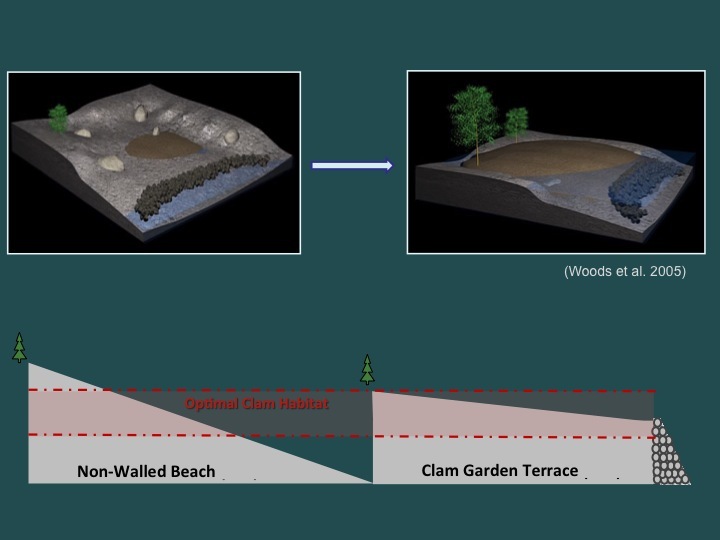 These features were made by constructing rock walls at the low tide line of sheltered, soft-sediment embayments, transforming sloping clam beaches into more level terraces. 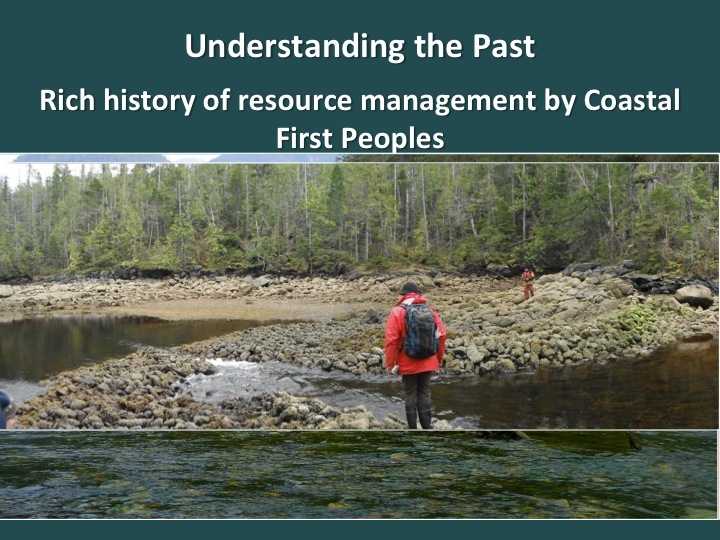 Traditional knowledge holders share that clam productivity was also enhanced by thinning clam, aerating substrate, the addition of shell hash and pebbles, and predator removal. 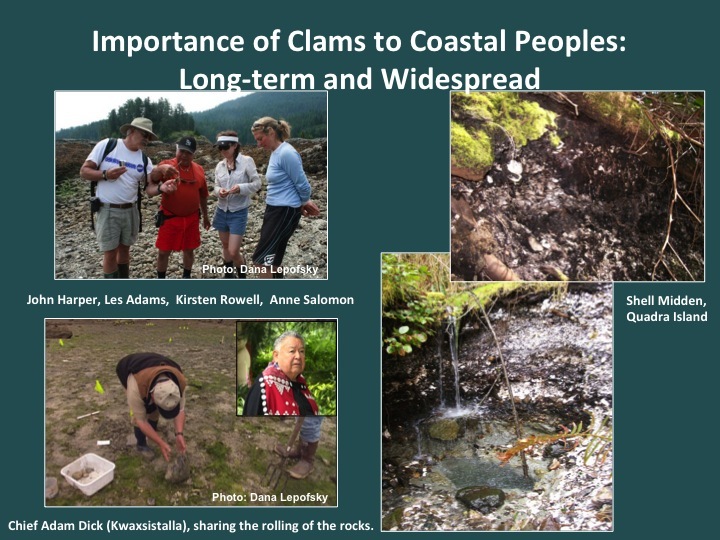 The region’s immense, deeply stratified shell middens are testimony to the both long-term and widespread importance of clams in ancient diets. 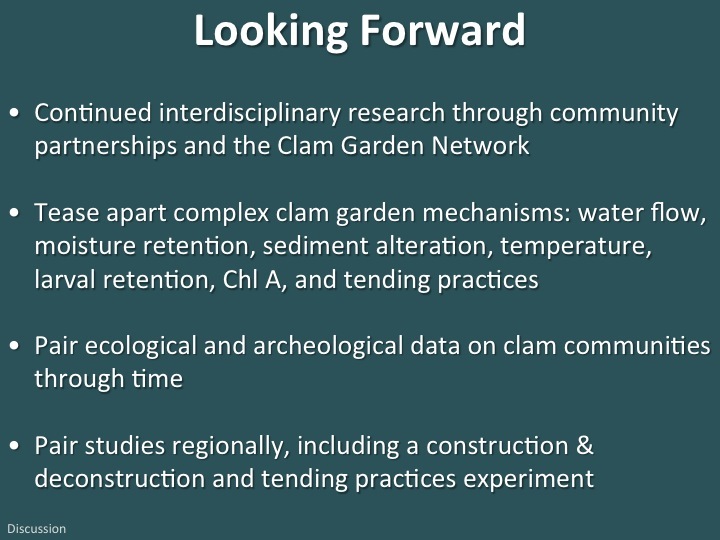 Not surprisingly, clam gardens have been recorded from Alaska through British Columbia (BC), into Washington State. 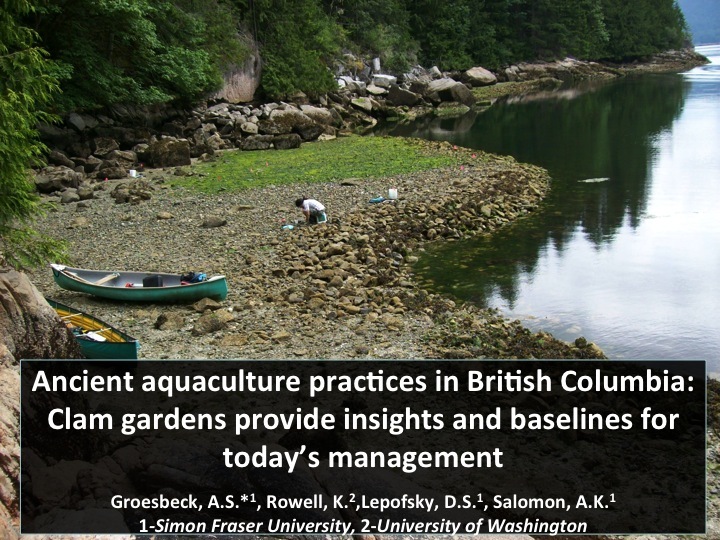 In our ecological study, we quantified the productivity of ancient clam gardens on Quadra Island, BC with field surveys and an in situ transplant experiment. 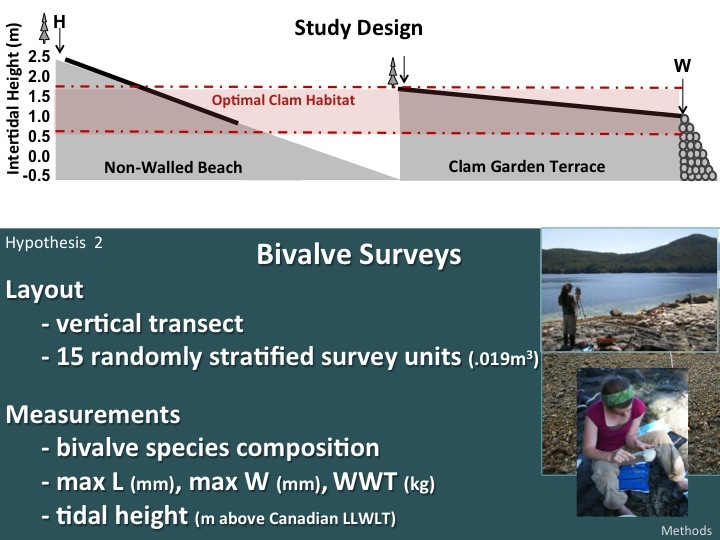 We measured how bivalve communities and beach morphology differ between clam gardens and non-walled beaches. 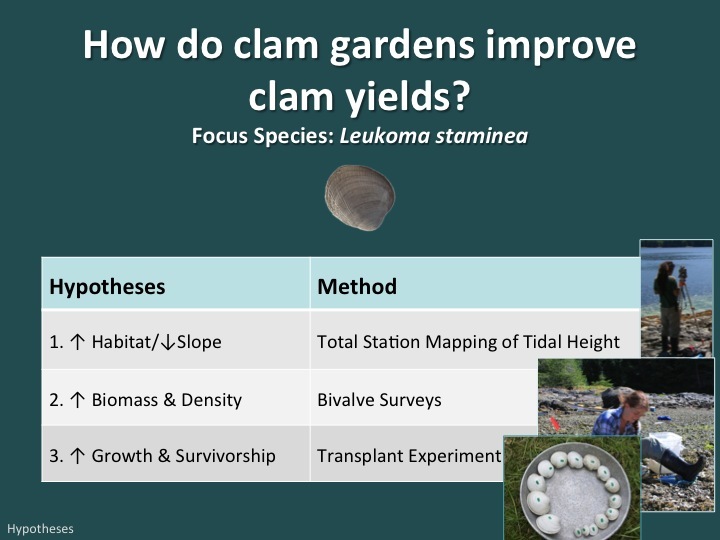 Specifically, we asked, do clam gardens have higher clam densities, biomass, and growth rates compared to non-walled beaches? And if so, what physical characteristics best explain these differences? 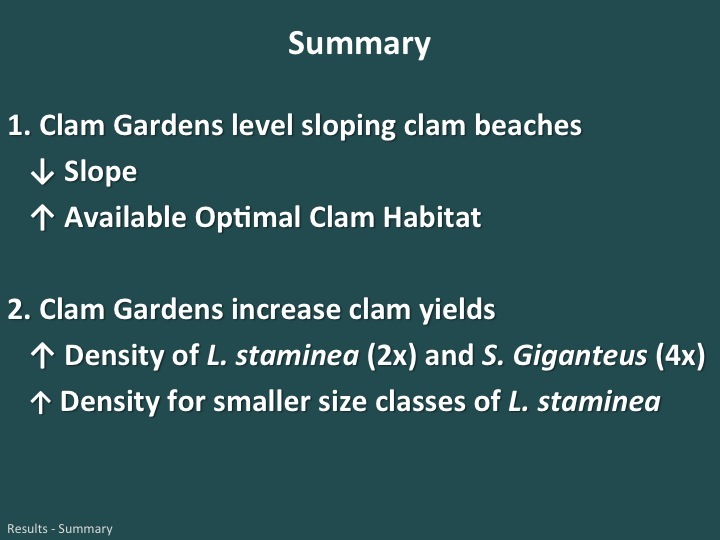 We conclude that clam gardens increased clam production. Transplanted littleneck clams grew nearly 2x faster in clam gardens relative to non-walled clam beaches, and smaller sized clams were more likely to survive. Surveyed clam gardens had 4x the number of butter clams and 2x the number of littleneck clams compared to non-walled clam beaches. 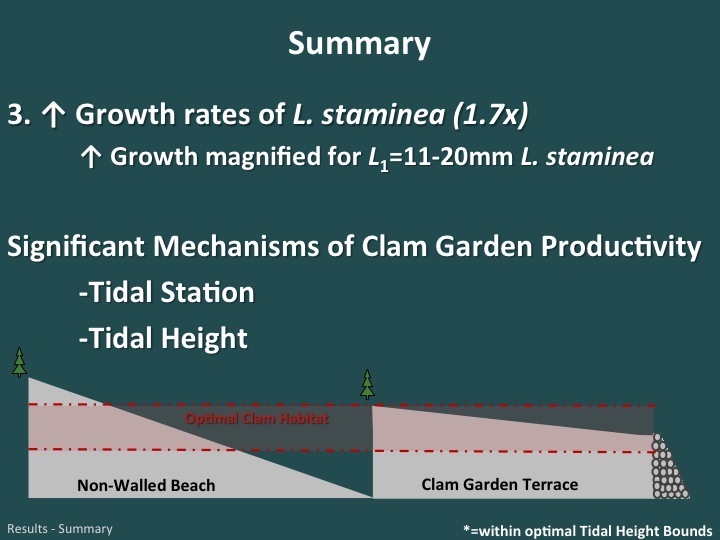 Finally, results from our transplant experiment confirmed that by reducing the slope of the beach, clam garden terraces expanded ideal clam habitat at tidal heights that provide optimal conditions for clam growth and survival. —Used by permission of the authors from Archaeology of Food: An Encyclopedia, edited by Karen Bescherer Metheny and Mary C. Beaudry. Rowman & Littlefield. Forthcoming. Groesbeck, Amy S., Kirsten Rowell, Dana Lepofsky, and Anne K. Salomon. 2014. 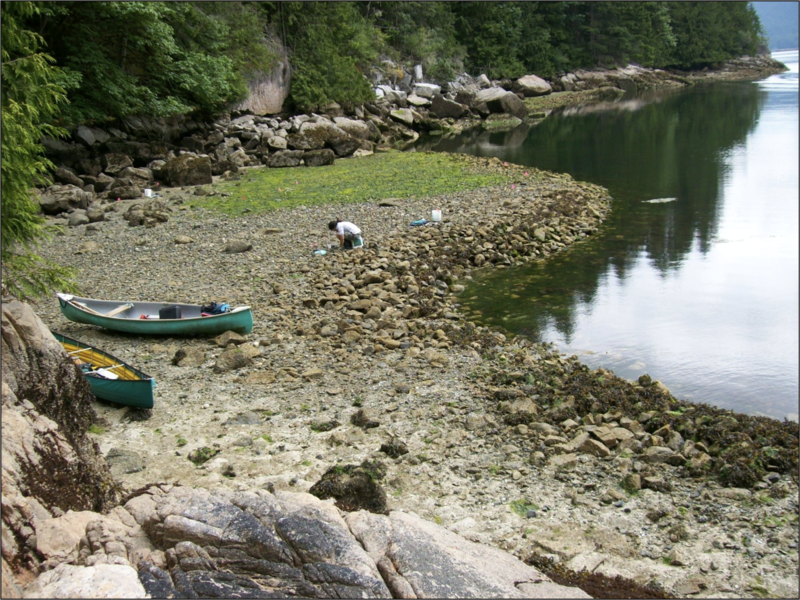 Ancient Clam Gardens Increased Shellfish Production: Adaptive Strategies from the Past Can Inform Food Security Today. PLoS ONE 9(3): e91235. Szimanski, Aaron, director. 2005. Ancient Sea Gardens: Mystery of the Pacific Northwest. Woods David J., Woods Diane, producers. Toronto: aquaCULTURE Pictures, Inc. Film. Lepofsky, Dana and Megan E Caldwell. 2013. 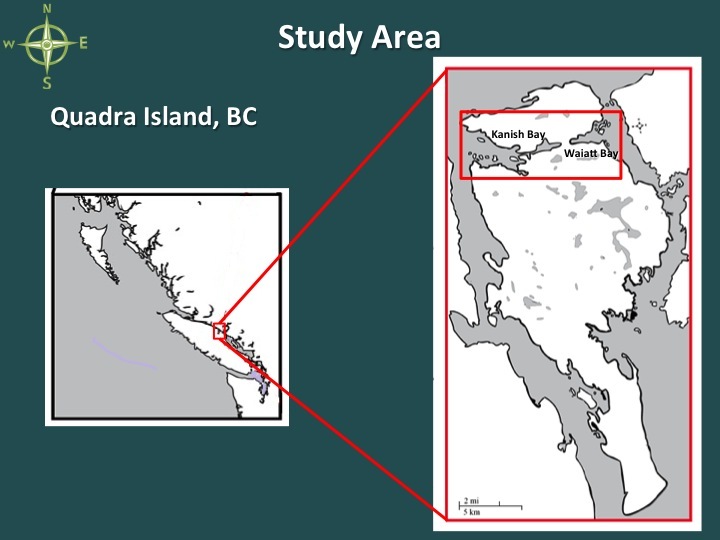 Indigenous Marine Resource Management on the Northwest Coast of North America. Ecological Processes 2:1:12.